Recently I felt under spiritual attack. No, I wasn’t spinning my head or spitting up pea soup, but I might as well have. My mind was filled with all sorts of lies, fears, and misconceptions. My mouth was filled with ugly accusations, manipulation, self-righteousness and vindictiveness. And in the process I was (unwittingly) taking part in a demonic plot to destroy one of my most precious relationships. Thankfully, I have a godly wife and good spiritual friends. As I confessed the stuff going through my heart and mind, their prayers, active listening and compassionately honest feedback woke me up to what was going on. It felt like coming out of a semi-trance when I realized what had happened and what I was thinking and saying. Letty told me afterward that she knew I was under spiritual warfare because I was tired. I am always more prone to the devil’s schemes when I am tired. Also, when I am hungry or angry or lonely. Hungry, Angry, Lonely and Tired. 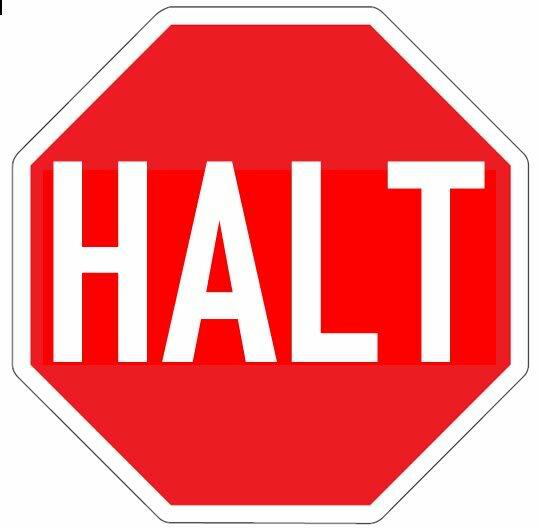 Put them together and they spell HALT. And whenever we are HALT, the enemy knows he has an “open house” to our soul. This is nothing new, HALT is seen throughout the Bible: When did Satan work his plan in Esau’s life? When he was hungry (Genesis 25:29ff). When did Satan work in Cain’s life? When he was angry (Genesis 4). When did the enemy work in David’s life? When he was lonely (2 Samuel 16). When did Satan work in Saul’s life? You got it – when he was tired (1 Samuel 14:20ff, he made a foolish vow when all of the Israelite army was fatigued). When did Satan work overtime in an attempt to penetrate Jesus’ life? During those times when Jesus was in a HALT state: after the 40 day fast (Luke 4) and in the Garden of Gethsemane (Matthew 26:36ff). So if Satan believed he could take advantage of Son of God during these times of human weakness; how much more does he take advantage of us in that state? 1. Jesus listened to His body. Don’t you find it interesting that Jesus was sleeping like a baby in the midst of a fierce storm on the Sea of Galilee? When Jesus needed a nap, he took a nap. He knew that the Father would take care of things while He tended to himself. Jesus also ate and drank regularly – which caused the “super religious” people to get offended (Matthew 11:19)! 2. Jesus nurtured His soul. Jesus withdrew and spent time with the Father in prayer. Jesus worshiped. Jesus knew His Scriptures, which leads us to believe that He made it a regular practice to study it (He didn’t download “YouBible” in His being before becoming incarnated!) It was a discipline; sometimes he had to say “no” to ministry and other things in order to nurture His soul. The depth of our soul-life gives us strength when our physical life may be lacking. 3. Jesus was connected with his community of faith. It’s hard to believe that Jesus would need His disciples, as they desperately needed Him. But I’m convinced that Jesus knew he could find strength and encouragement in this community of faith. Why else would Jesus ask His three closest friends to stay up with Him in Gethsemane? We all need the encouragement and strength that comes from our faith community. We give Satan too much credit in our lives. Most of his effective work is done when our bodies and souls are in such a poor state of affairs. Let’s be aware of his schemes. Don’t let HALT halt you from experiencing and sharing Jesus’ awesome life and love. I want to personally thank you for your blog it has been a great encouragment to me and I look forward to reading it everyone morning as I start my morning worship. Today’s lesson really hit home to me because I knew it was during those times that I seemed to be tempted the most but it is encouraging to know that throughout scripture I am not alone. Thank you again for the work you are doing I pray that you are able to continue for some time. Thanks for your encouraging words, Brad! I am blessed to know that you are reading my blog and that God is using it in your life. I agree. It is good to know we are not alone – that both the saints of old and the saints of now face the same common, shrewd enemy who knows how to push our buttons! But thanks be to God that He has given us the testimony of Scripture and the fellowship of our brothers and sisters to help us become more and more aware of his schemes. Here’s to the victory we have in Jesus to overcome darkness! Doug, Thank you so much for your blog today. This type of “trouble” finds me every time I’m exhausted and I don’t retreat away from people to rest. This is when I ALWAYS stick my foot in my mouth, when I say something and it comes out so wrong I’m shocked by what I just said. Every time! I am now learning, to follow the gentler path and just excuse myself and leave, or go to bed, or say I have to get off the phone now. Sometimes, I think, I surprise people when I have to use that response, but I now know, this is the lesser of the evils. Exhaustion just turns me into a different person and I don’t like her. And Yes, I’m sure the devil has had a hay day with me before I figured out what was going on. You know, I’m the type of person to talk first and then ask. This has been a slow process, but I pray and trust God is changing me in this aspect also. God bless you Doug. Thank you for spelling it out in clear print for me.